Before I started Polished Habitat, my job was in quality improvement for a hospital. I now use some of the same proven process improvement methods from my former career to help declutter our home. 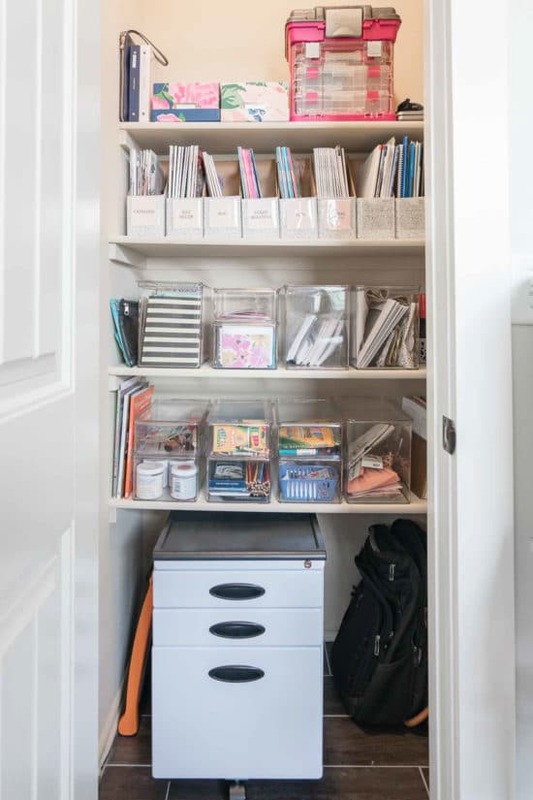 In particular, one method has helped us transform our house from hot mess to organized bliss…at least in most areas. We’re still working through others just like you! In business, it’s called the 5 Whys and it’s used to find the Root Cause of a problem. I think they should have named it the Toddler Method though! If you’ve ever been around a 3-ish year old who continues to respond WHY over and over during a conversation, you’re already an expert. And if you don’t know what I’m talking about, I promise this will work for you too! This process may seem so simple that it’s not worth doing. It is! I sat in rooms full of hospital administrators, nurses, and doctors using this method. It frequently led to identifying problems that we didn’t know were the real problem, and solutions that made a real difference. 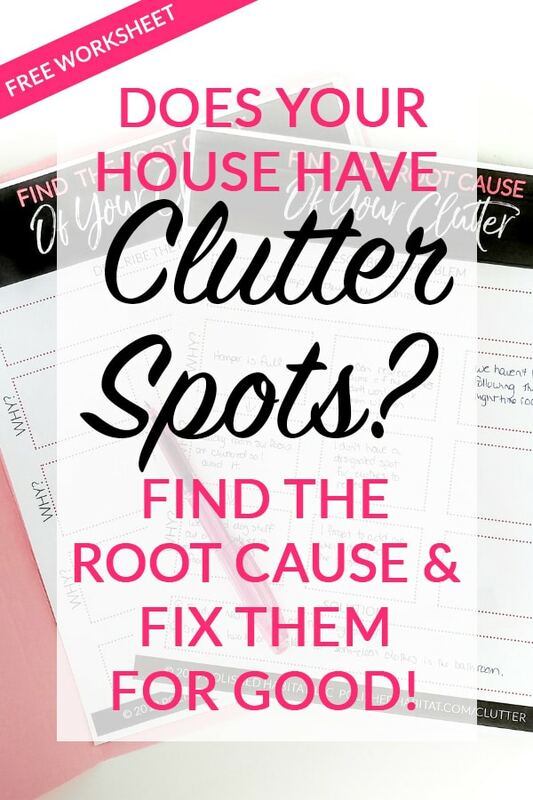 Around the house, we can clean up a certain location over and over again, but until we find the root cause of the clutter, the piles will continue growing back with a vengeance like aggressive weeds. On the flip side, when we slow down to figure out the real reason the area is collecting stuff, it’s like pulling those weeds out by the roots. Sure, new ones may eventually form, but growth will be slow and as long as we keep tackling them by the roots, our homes will be more organized and peaceful. In business, the method goes 5 Whys deep to really get down to the root cause of a problem. The number of WHY rounds can depend on the issue though. My rule of thumb is trying to go 1 level beyond the point I think I’ve found the culprit. 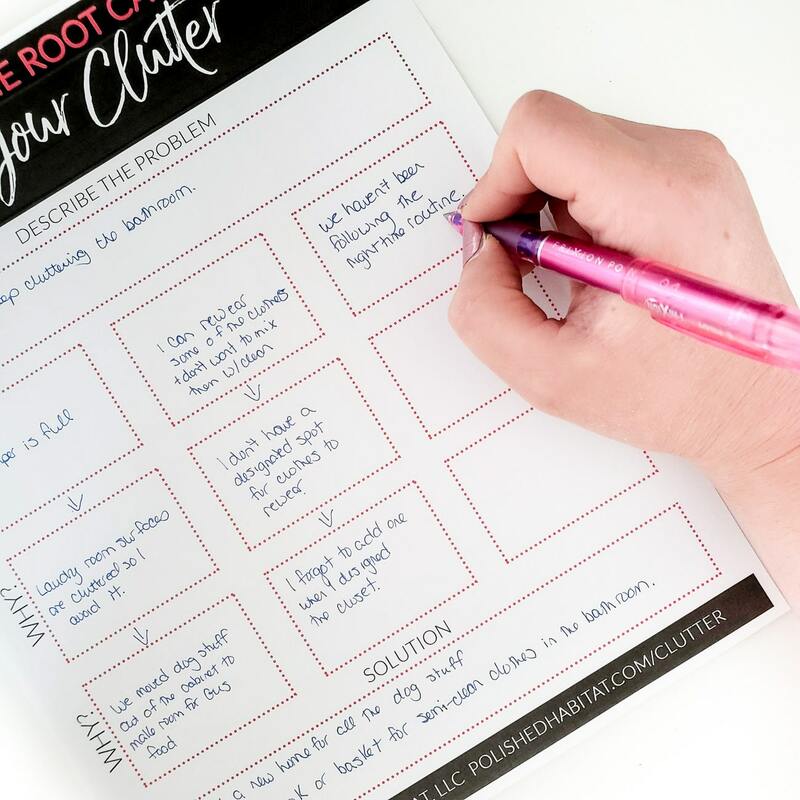 Everything is better with a pretty worksheet, so I created one to make the process even easier for you. It’s free when you join the weekly Polished Habitat Insiders newsletter. Just fill out your name and email address in the box below and then click the button! Now let’s look at a real-life example for my home. WHY: The hamper is full. WHY: The laundry room is cluttered so we don’t want to do laundry. WHY: All the dog’s stuff is taking over. WHY: We had to move it out of the cabinet to make room for Gus food. Solution: We need a new home for all the medicine, grooming tools, etc for the dogs. If you saw the clothes in the bathroom, you would never instinctively guess that the root cause of them was actually related to the dogs. That’s why this simple method is so powerful. By digging down to the source of the problem, we can create sustainable solutions. 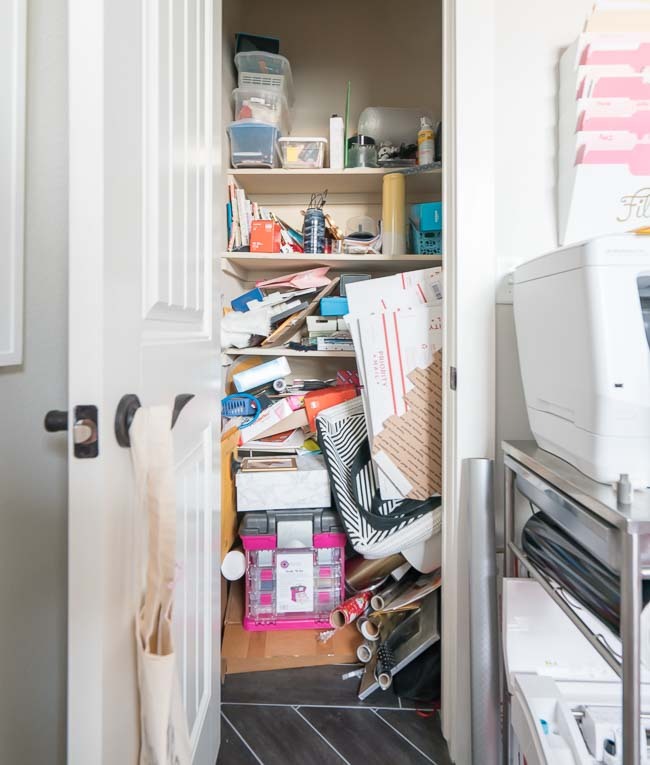 PS: We DID recently create a solution for this, along with a few other clutter root causes in a small storage closet. It’s also important to note that there’s often more than one root cause. Here’s another branch of the same problem. WHY: I only wore something for a few hours and can wear it again so I leave it on the counter. WHY: I don’t want to mix it back in with the clean clothes or forget that I can wear it the next day. WHY: I don’t have a designated spot for clothes to re-wear. WHY: The closet was planned out to the inch and I forgot this, so there isn’t a natural place to put these items. Solution: Create a basket or hook in the bathroom especially for the not clean/not dirty clothes. If we had just cleaned up the clothes, those “weeds” would come right back. And then frustration would set in that the same spot was getting cluttered frequently and we’d start to give up on it. The worksheet is flexible and you can fill in 3 different “whys” and then track them deeper as you go down the page. For other scenarios, your first “why” might be the same all the way across, but then the next level would be different reasons for the first why. Don’t get too hung up on filling it in “right” – as long as you’re brainstorming and filling in the boxes, you’re doing it perfectly! Keep in mind that while the examples above are all physical solutions, you might run into some psychological reasons for clutter or even “whys” that lead to other people. The process can also work for those, just keep asking why until you hit the point of seeing a clear solution. WHY: We take our shoes off when we come in and they get left by the door. WHY: My kids never pick theirs up and I’m tired of doing it for them. It’s tempting to stop at this point because you’ve reached the point of it being someone else’s mess. Keep going! WHY: They don’t respect how much the mess frustrates me. WHY: There aren’t any effective consequences in place and we haven’t had a calm discussion about it. Solution: Make a plan as a family. Ask them WHY they think the shoes pile up and what they think the solution should be. You might be surprised at what they come up with! I could talk about this process all day, but I’d rather leave you time to put it into action! 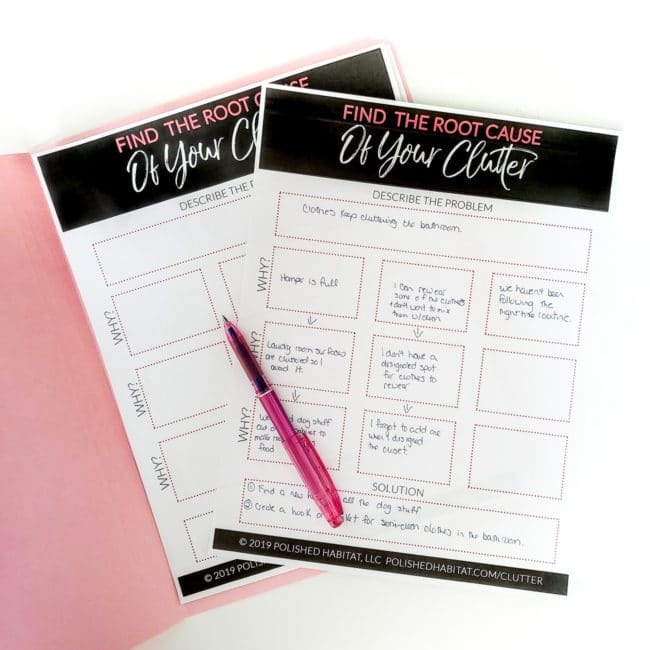 Print out your worksheet and then walk around your house and find one area that always seems to collect clutter. Go through the process and see if you can come up with at least one solution to implement this week! Just hit reply to any of the emails you get from me or you can comment below! If you want to take your commitment to decluttering a step further, the Polished Habitat Society is the place for you! It’s a totally separate, private membership area of the site where readers can interact with each other (and me) to get more detailed help specific to their home. Every week, we’re chatting about decluttering, organizing, and decorating. 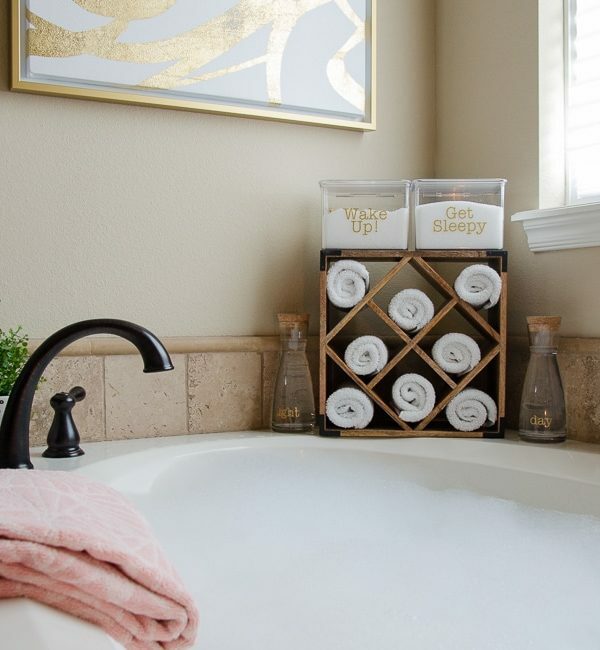 You’ll find endless encouragement, motivation, and ideas to help you create the home of your dreams. You can sign up here! My nightstand!!! Argh!! Going to try your method. I think most of the problem is the unorganized mess the drawers are. I keep stuff on top because I can’t find it when I put things in the drawers. Need to dig s little deeper into my whys. That sounds like the PERFECT space to try out the method! I ordered some extra dividers for my own nightstand when I cleaned out the other dressers, but I haven’t tackled it yet. Now that you mention it, I should use the worksheet for mine too. Let me know how it goes for you!